Next up on the vote are Entry Level Groupsets. Are the groupsets many of us started on back in the 90s cool? As ever you decide! Next up on the vote is the Girvin Flexstem. Is the suspension stem which provided an inch of suspension travel via an elastomer cool? As ever you decide! The latest Coolwall vote has been declared! Bula is UNCOOL. It would seem the company which made 100s of 15 year olds wear ski hats in the height of summer and put the neon into neon is UNCOOL. 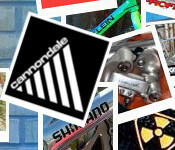 Next up on the vote are Cannondale. Are the Connecticut based company cool? Does history fondly remember their US made oversized aluminium frames You decide! The latest Coolwall vote has been declared! Shimano is COOL. From plastic coated 70GS up to XTR M900 the people of retrobike have judged Shimano to be cool. Next up on the vote are BULA. Are ski hats in summer and neon t-shirts cool? You decide! The latest Coolwall vote has been declared! Campganolo MTB Groupsets are COOL. Bullet shifters have a place on the cool wall. Next up on the vote are Shimano’s MTB Groupset. Is dominating the market for over 20 years cool? You decide! The latest Coolwall vote has been declared! Saracen is UNCOOL. Fillet brazing, U-brakes and snazzy 80s graphics couldn’t make up for the latter sins it would seem. Next up on the vote is Campagnolo’s MTB Groupset. Italian chic or misguided foray. You decide! The latest Coolwall vote has been called. Nuke Proof is apparently COOL. Next up on the vote is Saracen. Do the fine machines of the late 80s -> mid 90s make up for some of the late 90s -> mid 00s stuff? The latest Coolwall vote has been called. Mountain Biking is apparently COOL. Next up on the vote is Nuke Proof. We here at retrobike been contacted by a journo who is writing an article for BIKE on Nuke Proof. Any good quotes, observations or anecdotes may well find there way into said publication. The latest Cool Wall vote has been called. This one has a winner unlike others. Klein, the choice of the Yuppie and masters of oversized alloy are COOOOL. Next up on the vote is Mountain Biking. The latest coolwall is complete. 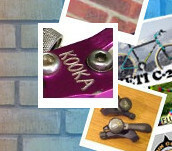 Kooka, the kings of the wacky anodising are COOOOL. The latest cool wall is complete. 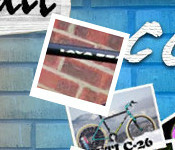 The Kona Lavadome, that stalwart of the mid range has been voted COOL. Next up on the vote is the kings of wacky anodizing Kooka. The cool wall vote on Trek OCLVs has been closed. 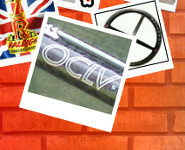 Retrobike has judged the Trek OCLV uncool :-(! Next up on the vote is the mid range champion of yesteryear the Kona Lavadome. The cool wall vote on e-stays has been closed. Retrobike has judged e-stays COOL! Next up on the vote is Trek OCLV. Marin & Thumbies are cool. Next up on the coolwall e-stays. The coolwall votes on Marin and Thumbshifters have been closed. Retrobike has judged both COOL! Next up on the vote is e-stays (or elevated chainstays). Spinergy is Uncool. Next up on the Cool Wall vote is Marin. The cool wall vote on Spinergy has been closed. 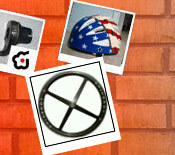 Retrobike has judged Spinergy uncool. Next up on the vote is Marin.